Leaders of the G8 nations have pledged to spend $60bn (£30bn) fighting Aids in Africa. It is thought the US will account for half the $60bn. BBC state department correspondent Jonathan Beale is travelling with the president and recording his experiences in a daily diary. 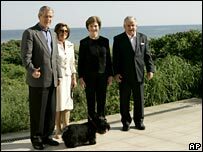 President Bush has been to Hel and back. Not a reference to his discomfort over his dicky tummy. But the Hel Peninsula in Poland where he landed for a whistlestop visit and meeting at the Polish president's retreat overlooking the Baltic. It's not just tired old hacks like myself who are having fun with the place name. 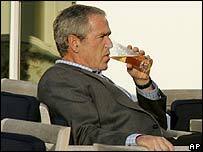 Even "Dubya" made fun of the reference saying, "Bush goes to hell - that's where a lot of people want me." Clearly he's seen enough of world leaders after the G8 summit. He was at his most animated greeting the Polish president's dog - a scottie similar to his own - Barney. "Great dogs - aren't they," he said looking at the Polish president's wife. Thankfully she took it in the spirit with which it was meant. White House staff say they're not sure whether it's something he ate or a stomach virus. As to suspicions that the was doing a "Boris Yeltsin" - US officials insist that was a non alcoholic beer he was seen drinking last night. Anyway a planned meeting with France's Nicolas Sarkozy had to take place in the American president's private rooms. One can only guess that he wanted to be close to the bathroom. Alarm bells rang when President Bush failed to turn up to a photo opportunity with Sarkozy and then failed to materialise at the G8 roundtable to discuss aid to Africa. Dan Bartlett - counsellor to the president - quipped that "he did not want to follow in the footsteps of his father" - a reference to that famous occasion in 1992 when George Bush senior threw up on the Japanese prime minister at an official dinner in front of the cameras.